Do you know of a little Prince or Princess who would love to attend a Frozen themed High Tea? 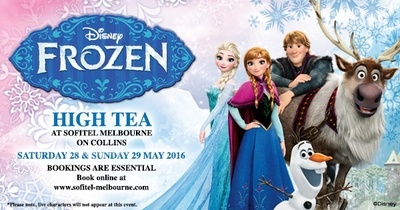 The Sofitel Melbourne on Collins will host a special High Tea dedicated to all things Frozen, this May. Here, they can win a prize for best dressed as they come as their favourite character from the hit Disney movie, sing their hearts out in a group sing-along, take selfies in the Frozen portrait studio, jump in the snow pit, and get crafty with some mask making. Your children will feast on Arendelle inspired delights like, coconut popcorn, coronation sandwiches, snow flake cookies and lots more wintry treats. Children’s tickets are priced at $85pp and adult tickets are $99pp. All children under 17 will receive a gift to take home.